Okay, so it seems that the DPS Barb has quickly become the latest trend post 1.0.3 Inferno nerf - and with good reason. This guide is mostly for solo play, though I'm sure it will mostly translate to 4 man parties as well. This is the build I currently use on my Barb for A3/A4. When talking about the skills, I will mostly be talking about them relative to A3/A4. This is your bread and butter for elite mobs. You will find out yourself which mobs definitely require this CD to be popped and which you can skip. Demonic Tremors/Phasebeasts come into mind when I think of WOTB. This is your second most important CD. You will need this against elites in conjunction with WOTB because of the high burst of some mobs in A3/A4. If you have godlike LOH/Life Leech you might be able to sub this out but for me it's a staple skill. You can sub this out if you have nice movespeed on your boots. Personally I just use this to get of jams and to chase down some annoying ranged mobs. This is another basically irreplaceable skill IMO. Huge resistance boost which you will probably need. Again, if you have amazing gear you can justify removing it, but for most people it's probably not realistic. Your main damage dealer, Side Arm is a nice proc that adds a deceptive amount of damage. You can use Maniac but I do believe Side Arm provides a greater benefit. This skill can be used in a majority of ways. You can gather a ton of spiders to basically act as healing wells when fighting elite mobs, but it also does a nice amount of damage. Again gearing will dictate the importance of this skill. The greatest disparity between builds will probably be the passives. I personally use 3 defensive passives because my gear is very offensively orientated. You can always experiment yourself to see what works. The less defensive passives you have to rely on, the better. Other ones I would consider are (all 3 which I use in A1/A2): Ruthless, Weapons Master, Bloodthirst. Bloodthirst: Okay I just played around with this passive in A3. Since I didn't go for any sort of LOH/Life steal this was a GREAT passive for me while Dual Wielding. Definitely try it out if you have over 50k DPS DW. My setup was Ruthless/Armor/Bloodthirst. 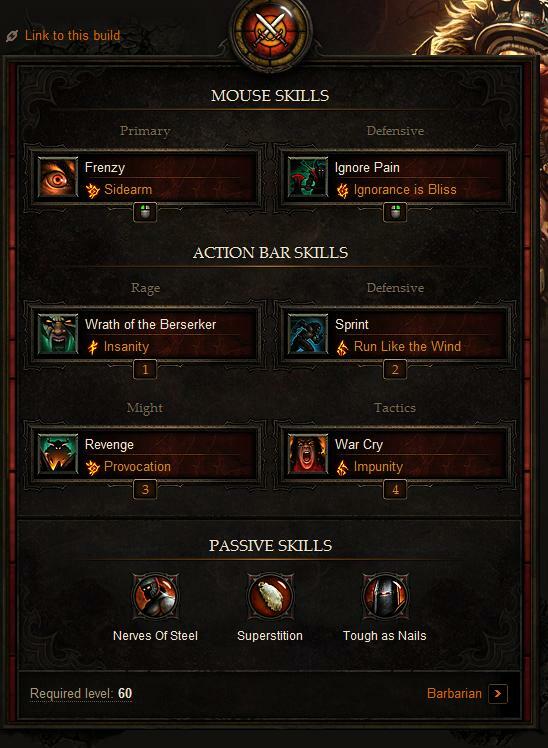 Overpower is a great option if you can survive without some of the other skills. It has a few good runes (heal/reflect/crit% increase) that you can experiment with. Personally in A1/A2 I run with the crit% increase and find that the CD ends up refreshing pretty quickly. The reflect rune will proc LOH as well, so this is a quick heal if you have this stat stacked. Battle Rage is another great skill to consider if you find yourself too tanky. It gives a huge constant damage boost, especially with the Marauder's Rage rune (my personal preference). You can also use the fury generator if you are using a lot of fury based skills. Since my focus is Frenzy, I typically run with the damage increase. Earthquake is another skill that is great for bursting down CERTAIN elite packs. Since the skill is very situational, I don't recommend using it at all times. It's great versus certain bosses and melee elites but otherwise you could probably use a different skill here. The above is how I would prioritize looking for gear. Shoulders: I looked for the highest str shoulders with at least 50 res. Shoulders can get huge str rolls for relatively cheap. Vit is a bonus, but if you can get nice vit on them too, go for it. Look for at least 200 str +. Belt: Belts seem to have nice stat rolls all around, I used this slot to make up for whatever deficiencies I had elsewhere. I looked for 180+ str/50 res/50+ vit. Another expensive alternative is a nicely rolled Lamentation. Look for one with Frenzy damage, high str and AR. The reason you want this belt is because it offers 1% crit chance and a nice life steal% boost. Chest: Chests can get pretty expensive, so I went with one without AR. I looked for a 3 socket 140str/140vit chest which became my main stat piece. I ended up with a decent one for around 400k which I still have been unable to replace. Pants: Pants again have a huge range for pricing. Budget pants can be had for relatively cheap so if I were gearing for A1/A2 I'd look to save in this slot. You can get 90str/90vit/40 AR pants for almost nothing. For the latter acts you will probably want an upgrade - I looked for high res and with decent stats. Bracers: I looked for crit% in this slot since it's one of the few armor pieces that can carry crit. The max is 6% and the closer to that you can get the better. Your ideal bracers are obviously going to be STR/VIT/Crit/AR. If you can't afford the 4 mods, pick crit and 2 others (depending on your needs) but you WANT crit here. Shield: Obviously this is for you if you choose not to DW. DW'ing means your gear without shield is godlike, if you are having trouble you can pickup a shield. 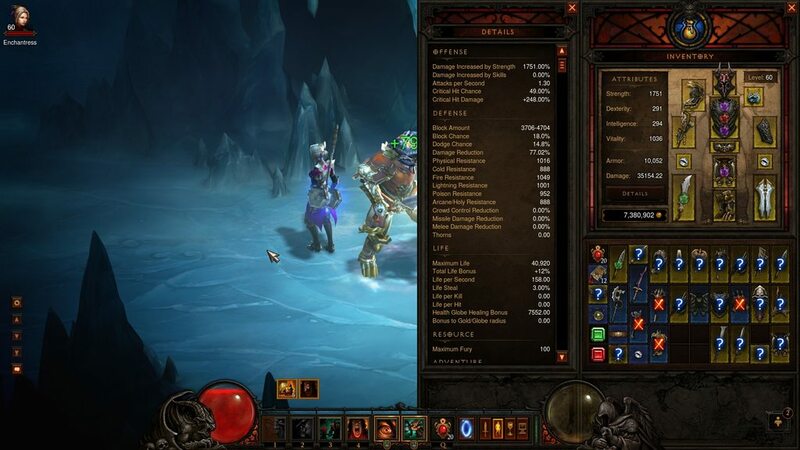 You can still DPS pretty well with one because they can carry a very high crit %. Look for a nice Sacred with 8%+ crit/AR/Str/Vit (Crit being the most important, the other stats will again depend on needs). Gloves: This slot can be a huge damage boost due to the wide range of crit/attack speed mods. If you can empty your gold stash to get a nice pair, by all means do it. You definitely want at the very least crit chance though. Everything else is gravy. My gloves are str/AR/crit chance. My ideal gloves would be Str/AR/Crit Chance/Crit Damage, I'd worry about Vit in another slot. Amulet: This and rings are probably the most overpriced (or hardest to upgrade) slots. My advice: buy whatever you can afford. I couldn't afford a Str/Vit/AR/Crit% ammy so I looked for the highest stat str/vit/crit I could find and went with that. Without the AR the prices dropped significantly. Rings: Again, unless you are a bajillionaire you probably won't get every desirable mod you want. Crit% and Crit Dmg would be ideal, but I personally used rings to fill in the holes in my build. I was lacking res/vit due to skipping out on it in every other slot. I ended up searching for Str/Vit/AR rings which I found to be relatively cheap in comparison to your Str/Crit/CritD. Remember, you want your final stats to be good - so buy what you can afford and keep your goals in mind. Boots: You definitely want all of Str/Vit/AR in this slot. If you can get movement speed too that's great. Sage's Seekers can be had for relatively cheap and can have all the above mods. I personally run with a pair of high stat/AR boots with no movement speed. Helm: This is another crit% slot. You definitely want Str/Crit%/Res. Socket is nice but expensive, I leave those to the tank barbs. Andy's is a great mid tier option and can be valuable even in the late game if your other gear can cover the lack of resistances. Weapon (s): My recommendation: 50% of your budget should be going to your weapons. As a DPS barb you have to be able to kill things before they kill you, and your weapon will affect your damage sheet the most. Crit Damage: Your max roll on a weapon is 100% crit damage, get as close to this as you can. Socket: If you can get Crit damage AND a socket, then you're in the money. With your (hopefully) high built-in crit%, the weapon will scale MARVELOUSLY. Damage: You want at least 750+ DPS on your weapon (depending on the amount of Crit damage you get). If you're rolling with only 50% crit damage on your wep, you want 900+. Again this scales with what you can afford, but don't underestimate the benefit of crit damage. I normally search crit damage 50% + has socket and I sort by DPS. Make sure you have a spreadsheet out to help you decide which weapon will yield more damage. Str: Self explanatory, Str means more damage. More damage good. LOH/Life steal: LOH is something I've never run on my barb as it inflates the price of weapons insanely. Being a DPS barb you really just want high damage. If you can afford it though, it's a great luxury that will help you with tough mobs. Life steal will come into play once you hit certain DPS levels. I run around with 80k DPS in A1/A2 and the lifesteal I get back is pretty immense. I'd recommend at least 40-50k DPS before considering lifesteal. Sword/Board Here are some benchmarks I have for each Act that you can aim for (post impunity buff). If you hit these numbers you should be able to clear the Act with relative ease. Edit: Again these numbers are strictly relative to each other. If you have higher DPS you can probably beat it with lower AR. If you have LOH you can probably beat it with less AR. I used 0 LOH and was fine with the below stats. Okay I'm separating S/B and DW because in the end game they are very different. Generally speaking, DW will have much higher damage. Combat will be not much different than your typical Barb play. I will normally use WOTB for every elite mob I encounter as I normally don't find an elite mob every 2 minutes. Ignore Pain should only be used when you are below 40% HP and not popped on initiation. This is your only healing spell. Don't be afraid to use potions of course, and if you are in a jam use Sprint to maneuver to safety. Personally, Phasebeasts and Tremors give me the most trouble but outside of these 2 mobs I can faceroll most of A3/4. Remember to assign a key to move separate from your Attack button. I binded mine to Mouse4 and I use this to either run to Health Globes or move out of Chains/Desecrator/Plague range. You want to maintain a healthy amount of damage because with your health amount you simply won't be able to take too much punishment. If you're a new player a lot of the higher end gear will probably be too expensive. Don't be afraid to just farm A1/A2 though, as you can get some pretty nice drops in these Acts. Don't get discouraged if you die a lot. It takes a while getting used to not having as much health and not facetanking every mob. When upgrading your pieces, don't buy the first piece you see. Shop around. You see 100str/100vit/60AR boots for 5M? Check how much 100str/90vit/55AR boots are. If you can save 4M, that's 4M spent on a bigger upgrade everywhere. Remember your stats are all cumulative, you don't need perfect pieces because this will shoot the cost up. Having one godly piece of gear will not solve your problems. Look for incremental upgrades and sell your old gear! Check how much stats you gain and weigh it against the price. Is it worth upgrading from 230 str to 240 str shoulders for 5M? Probably not! Again the gearing is flexible, I just posted what worked for me.